15 watt 1x8" Portable Amp, 2 inputs, line in, chargeable for busking! Korg Rhythm! 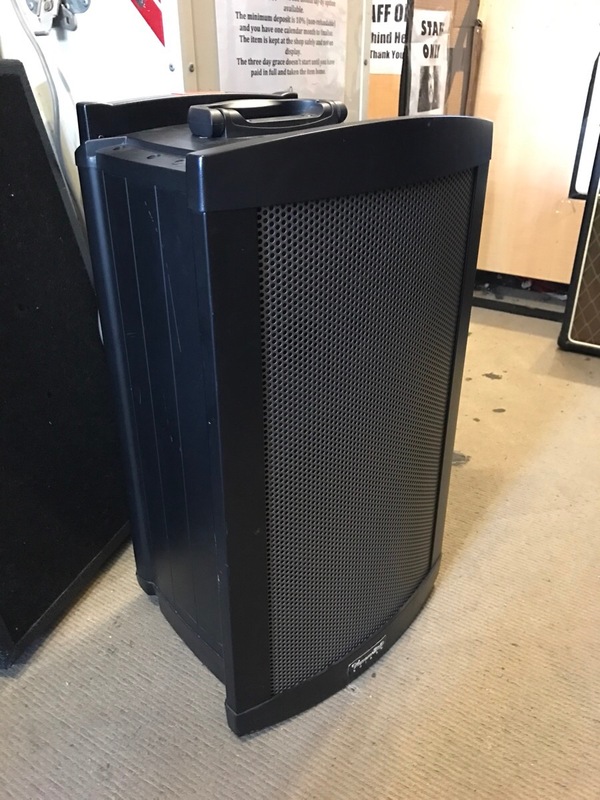 The ultimate portable PA! Runs on batteries (6 x D size) or power supply (included!). It's a drum machine with 24 patterns: (8 Beat1, 8 Beat2, 8 Beat3, 8 Beat4 Shuffle, 8 Beat5, Unplug1 Cajon, Unplug2 Conga, Unplug3 Djembe, Oldies, Country1, Country2 Train Bt, Country3 3/4, Rock1, Rock2, Blues1, Blues2, 16 Beat1, 16 Beat2 Shuffle, 16 Beat3, Jazz1, Jazz2 3/4, Latin Jazz, Bossa, Samba). Built in mixer and PA with Reverb! Mic input and two jack inputs. You could plug a mic in, guitar and a bass or keyboard, then hit the streets with the drum machine doesn't talk back! Vibe the whole city out! Recording and playback function (say what?!) Yes, you read correctly! Auxiliary in too. 2 x 4" speakers. 80 watts RMS. This thing pumps! And it's in super clean condition! Barely touched! Includes manual and box too. Look at it! Just look at it! Wow! 15 watt 1x8" busking amp. Rechargeable Battery and/or mains powered. 8 hour battery life. New battery installed. Modulized Wireless Portable Sound System. 120 watts RMS. Internal rechargeable battery. Speaker system: 10" LF, 1" HF and crossover. A whole host of add-ons can be bought for this. This is the basic power amp with speaker in and out, and mic/power amp in and out with volume control. Enter your email address below to get alerts for Busking amps.